All in all, Majority Commissioners Charley Martin and Rob Loughery say things are going well for Bucks. Unemployment is consistently lower than the state average, and Standard and Poors has given the County a premium AAA bond rating two years in a row. Considering the difficult challenges facing communities everywhere, Bucks has endured the worst of the recession and prospered. And it’s thanks to Republican leadership. PoliticsPA talked with the men seeking to extend Republicans’ control of the Bucks County courthouse. Click here to read our interview with the Democratic candidates – Commissioner Diane Ellis-Marseglia and Doylestown Borough President Det Ansinn. Our preview of this “Race to Watch,” will be posted later today. Martin, 69, has been married for 34 years. He has a daughter and two grandchildren, ages 10 and two and a half. He worked for 30 years at the Philadelphia Electric Company, rising to the position of public affairs officer by the time he retired in 1995. He served 12 years as Supervisor of Upper South Hampton Township from 1983-1995. Martin has served on the Board of Commissioners since 1995. He’s won election four times, and says this would be his fifth and final term. Relatively speaking, Loughery is brand new. He was appointed to the Board earlier this year after Commissioner Jim Cawley was sworn is as Lieutenant Governor. Loughery is 41, married and has three daughters ages eleven, nine and seven. He’s a partner and founder of the Keystone Redevelopment Group, a real estate investment LLC that redevelops old industrial properties and brownfields. In the 90s, he worked for the Bucks County Redevelopment Authority and the Bucks County Economic Development Corporation. He boasts activity on a dozen area civic organizations and committees, but this is the first time he’s held public office. 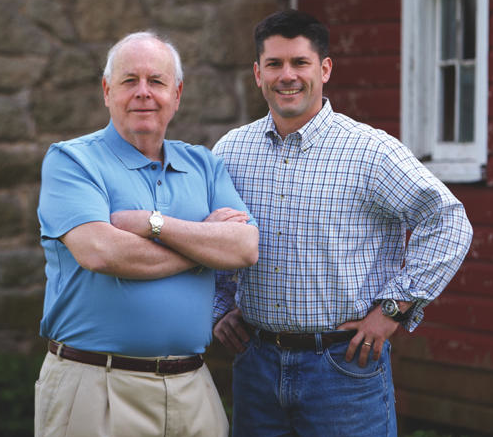 Moreso than their Democratic counterparts, Martin and Loughery are reliant on the county party for their day-to-day operations. They campaign out of party headquarters, where three staffers manage Bucks GOP business. That’s slated to change soon. And Loughery isn’t concerned about the 191,778 to 178,057 voter registration edge of Bucks County Democrats. “The deficit that we have voter registration wise hasn’t increased, it’s actually decreased. I think that you’ll see when it comes to the county elections, especially in Bucks County, people see and recognize the quality of life that they have here, and that’s been brought through Republican leadership. I think that’s how we trend different than you may see in the black and white numbers in the voter registration polls. “In our municipalities we have incumbents – stronger teams in the majority of our municipalities – and I look forward to campaigning with them,” added Martin. We asked Martin and Loughery to draw a contrast with their opponents. It’s a string of events that threatens to become a pattern, and a pattern that threatens to taint the Republican brand in Bucks County. But Martin and Loughery say efforts to link them with courthouse misdeeds are politically, rather than factually motivated. “Certainly we can’t deny there were individuals who were charged with misusing their office, two of them are no longer county employees and they will be dealt with appropriately by the Court of Common Pleas. For 2,600 county employees, that blip is very unfortunate,” said Martin. Loughery noted that Republican officials were essential in bringing the problems to light. Both Republicans emphasized their belief that the election would be a local, rather than statewide contest. But Martin acknowledged that observers have reasons to watch Bucks County. Left unsaid by Martin, but often mentioned by GOP politicos talking about this race, is the view that Loughery is in line to join that list of names if he wins re-election this year. Meghan Schiller contributed to this report.